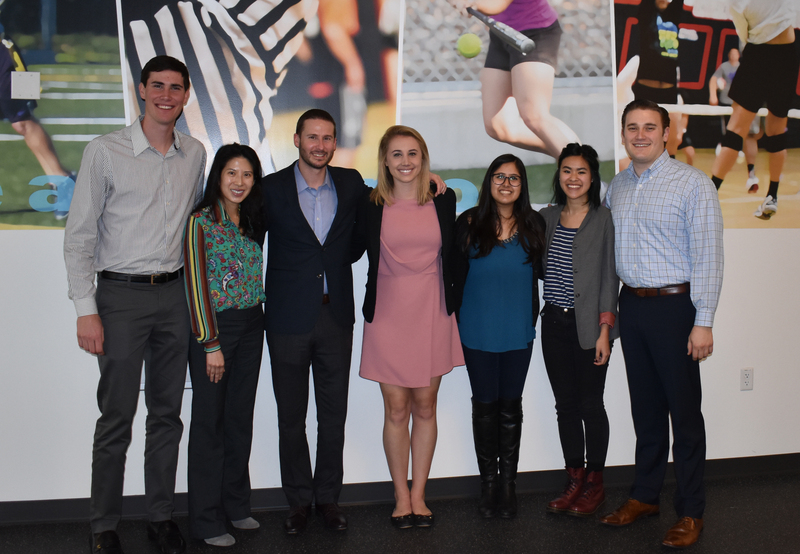 Senior Vice President of Business Development of the Golden State Warriors Brandon Schneider visited the Guyette Leadership Fellows on campus on March 22, 2016 to discuss the trajectory of his career and answer questions the fellows might have. Starting out at a base salary, Schneider ended up a manager for the Warriors at the young age of 24. As he spoke to the even younger group of Professor Nancy Lam’s students, he gave tips for their future careers and insider scoops on the Warriors’ projected goals. "I fell into a job," he said. He didn't think he would work in sports, but he grew up loving them. He had never thought of working in sports as career opportunity, because at 5' 10 he couldn't jump. “I was a decent athlete as a kid, but not good enough to do that for a living," he said. First he waited tables for a bit. Then he talked to a family friend who was the general manager at Fox Sports Net, the company that broadcasted the Giants games at the time. He was hired and started working at with the Golden State Warriors in 2002. Schneider shared that he has worked very hard to get where he is now, with lots of overtime, working many more than 40 hours per week. He manages a team of mostly millennials, and his job includes overseeing the tickets sales group, the suite sales group, and the retail business. Of course many of the students were eager to hear from Schneider about the team’s recent playoff successes. They have already made it once. "We plan on 16 out of 30 teams to make the playoffs, and we had 18 years to win it once; it's actually really hard to do," said Schneider. "With Durant, we're 57 to 14 right now, the best record in the NBA, and we just won our 28th road game of the year last year. We're the first team in the history of the NBA to win 28 or more road games in three consecutive seasons. It’s pretty likely that we will win 8 of our last 11 depending on how things go. If we do that, we will be the first team in NBA history to win 65 games. It's a pretty amazing time." Schneider had a lot of advice for the students, including work hard, do your best, and don't slack off. The Guyette Leadership Fellows program was started in February 2014 to develop the next generation of business leaders for a changing world. Leadership Fellows are selected by a competitive process. The aim of the program is to provide the select group of students with access to industry-knowledge and experiences to cultivate their leadership development. The students are led by Nancy Lam, Ph.D., a professor in the SEBA Graduate Business Program.